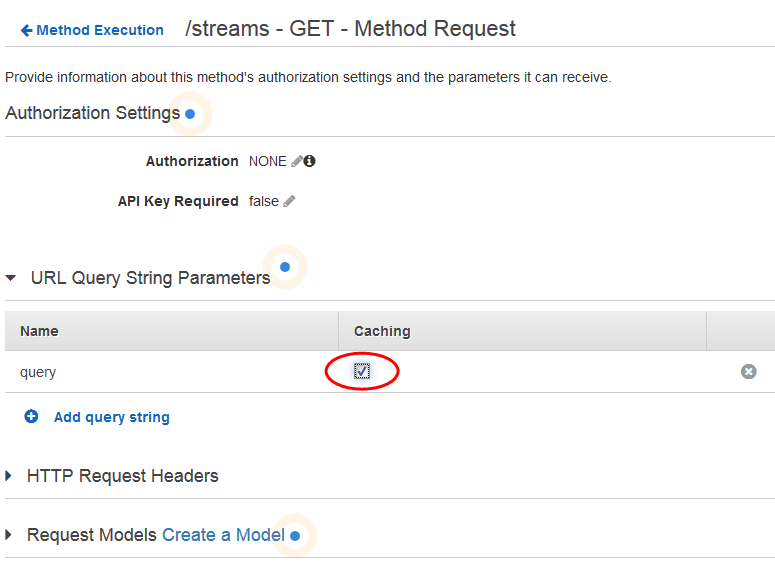 You can enable API caching in Amazon API Gateway to cache your endpoint's responses. With caching, you can reduce the number of calls made to your endpoint and also improve the latency of requests to your API. When you enable caching for a stage, API Gateway caches responses from your endpoint for a specified time-to-live (TTL) period, in seconds. API Gateway then responds to the request by looking up the endpoint response from the cache instead of making a request to your endpoint. The default TTL value for API caching is 300 seconds. The maximum TTL value is 3600 seconds. TTL=0 means caching is disabled. The maximum size of a response that can be cached is 1048576 bytes. Cache data encryption may increase the size of the response when it is being cached. This is a HIPAA Eligible Service. For more information about AWS, U.S. Health Insurance Portability and Accountability Act of 1996 (HIPAA), and using AWS services to process, store, and transmit protected health information (PHI), see HIPAA Overview. When you enable caching for a stage, only GET methods have caching enabled by default. This helps to ensure the safety and availability of your API. You can enable caching for other methods by overriding method settings. Caching is charged by the hour and is not eligible for the AWS free tier. 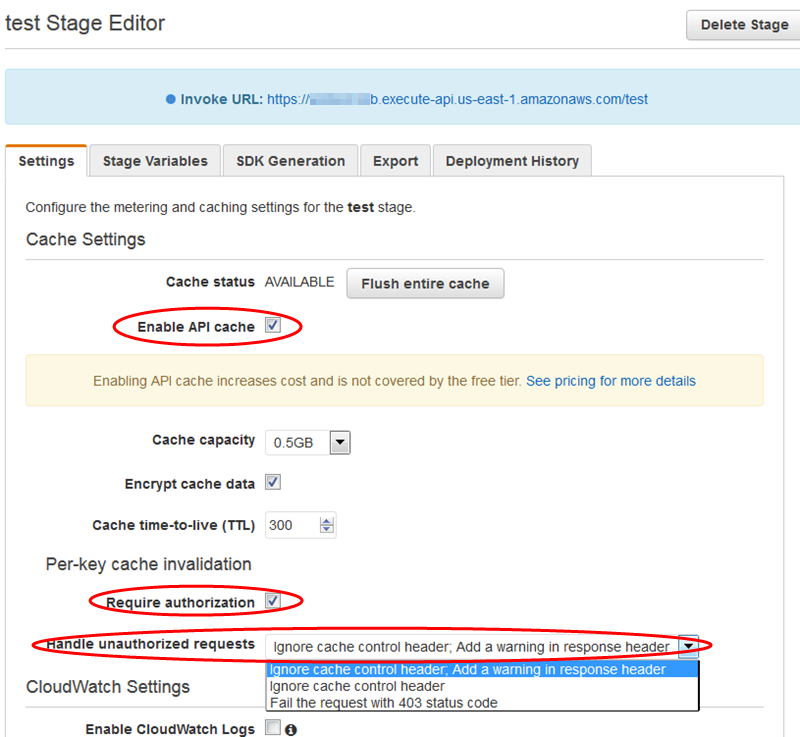 In API Gateway, you can enable caching for a specified stage. When you enable caching, you must choose a cache capacity. In general, a larger capacity gives a better performance, but also costs more. API Gateway enables caching by creating a dedicated cache instance. This process can take up to 4 minutes. API Gateway changes caching capacity by removing the existing cache instance and creating a new one with a modified capacity. All existing cached data is deleted. In the API Gateway console, you configure caching in the Settings tab of a named Stage Editor. Go to the API Gateway console. In the Stages list for the API, choose the stage. Wait for the cache creation to complete. Creating or deleting a cache takes about 4 minutes for API Gateway to complete. When a cache is created, the Cache status value changes from CREATE_IN_PROGRESS to AVAILABLE. When cache deletion is completed, the Cache status value changes from DELETE_IN_PROGRESS to an empty string. When you enable caching within a stage's Cache Settings, only GET methods are cached. To ensure the safety and availability of your API, we recommend that you not change this setting. However, you can enable caching for other methods by overriding method settings. Inspect the CloudWatch metrics of CacheHitCount and CacheMissCount for your API and stage. Put a timestamp in the response. You should not use the X-Cache header from the CloudFront response to determine if your API is being served from your API Gateway cache instance. You can override stage-level cache settings by enabling or disabling caching for a specific method; by increasing or decreasing its TTL period; or by turning encryption on or off for cached responses. If you anticipate that a method that you are caching will receive sensitive data in its responses, in Cache Settings, choose Encrypt cache data. Sign in to the API Gateway console at https://console.aws.amazon.com/apigateway. In the Stages list for the API, expand the stage and choose a method in the API. Choose Override for this method in Settings. When a cached method or integration has parameters, which can take the form of custom headers, URL paths, or query strings, you can use some or all of the parameters to form cache keys. API Gateway can cache the method's responses, depending on the parameter values used. Cache keys are required when setting up caching on a resource. In this request, type can take a value of admin or regular. If you include the type parameter as part of the cache key, the responses from GET /users?type=admin will be cached separately from those from GET /users?type=regular. To include a method or integration request parameter as part of a cache key in the API Gateway console, select Caching after you add the parameter. When API caching is enabled, you can flush your API stage's entire cache to ensure your API's clients get the most recent responses from your integration endpoints. To flush the API stage cache, you can choose the Flush entire cache button under the Cache Settings section in the Settings tab in a stage editor of the API Gateway console. The cache-flushing operation takes a couple of minutes, after which the cache status is AVAILABLE immediately after flushing. After the cache is flushed, responses are serviced from the integration endpoint until the cache is built up again. During this period, the number of requests sent to the integration endpoint may increase. This may temporarily increase the overall latency of your API. A client of your API can invalidate an existing cache entry and reload it from the integration endpoint for individual requests. The client must send a request that contains the Cache-Control: max-age=0 header. The client receives the response directly from the integration endpoint instead of the cache, provided that the client is authorized to do so. This replaces the existing cache entry with the new response, which is fetched from the integration endpoint. To grant permission for a client, attach a policy of the following format to an IAM execution role for the user. If you do not impose an InvalidateCache policy (or choose the Require authorization checkbox in the console), any client can invalidate the API cache. If most or all of the clients invalidate the API cache, this could significantly increase the latency of your API. When the policy is in place, caching is enabled, and authorization is required, you can control how unauthorized requests are handled by choosing an option from Handle unauthorized requests in the API Gateway console. Fail the request with 403 status code: returns a 403 Unauthorized response. To set this option using the API, use FAIL_WITH_403. Ignore cache control header; Add a warning in response header: process the request and add a warning header in the response. To set this option using the API, use SUCCEED_WITH_RESPONSE_HEADER. Ignore cache control header: process the request and do not add a warning header in the response. To set this option using the API, use SUCCEED_WITHOUT_RESPONSE_HEADER.